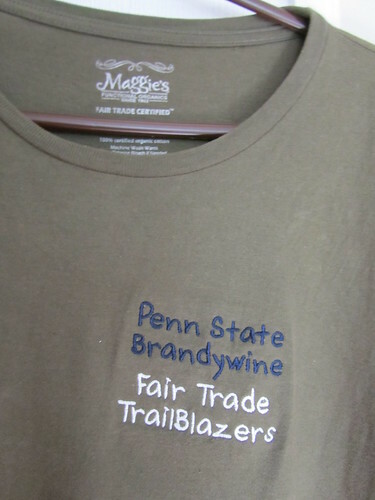 To unify the initial Penn State Brandywine Fair Trade TrailBlazers in their “look” and support of the movement, I purchased t-shirts for each of the students from Maggie’s Functional Organics and had the shirts embroidered by a local shop in Media, Christina’s Embroidery Design. Maggie’s Organics is known for its sustainable and ethical apparel, where all of their products are made with certified organic cotton or wool. All of their unisex t-shirts (which we ordered) are Certified Fair Labor and Fair Trade Certified. We went for the moss-colored shirt, with blue-and-white stitching (after all, we are Penn State). We have been surprised at how popular these shirts are. Many people have told us they want one of their own. Alas, these are one-of-a-kind customized shirts for the one-of-a-kind group of TrailBlazers. But we certainly take advantage of the opportunity to tell people about Maggie’s Organics and the opportunity to purchase Fair Trade clothing. We encourage everyone to check out their website for fun and feel-good clothing!